The MagniLink Vision with text to speech functionality, MagniLink Vision TTS, is the most advanced CCTV from LVI. You get advantage of having a high quality CCTV that also reads text aloud. That’s the best of both worlds - all in one product! Use the CCTV mode for writing or reading and when you get fatigued or encounter long passages, just press the touch screen and the MagniLink Vision TTS will read the text displayed on the screen. The spoken text is synchronized with the magnified text and is easy to follow if you wish. Or just sit back, and let the MagniLink Vision TTS do the reading for you. You’ll find it restful and enjoyable. Plus the reading mode helps maximize your reading endurance. MagniLink Vision TTS is designed for intuitive operation. Just press the touch screen to toggle between the CCTV and speech mode. Use the tactile buttons to adjust volume, speed, display modes etc (see the picture above). If the paper is misplaced (up to +/-20°) the orientation will automatically be corrected. Text can also be read upside down and you will receive a warning if the paper for example is placed face down. Preferences for contrast enhancement, colors, fonts and more can be adjusted for each user and additional languages can be added at any time. Text can be saved to or opened from the included USB-stick. Plus in situations where it’s desirable to keep the sound down, like in a library, the Vision TTS is equipped with a headphone jack for personal listening. MagniLink Vision TTS is a complete solution. It combines an excellent CCTV - with superior picture quality, an award-winning design, silky-smooth reading table and more; with speech output. 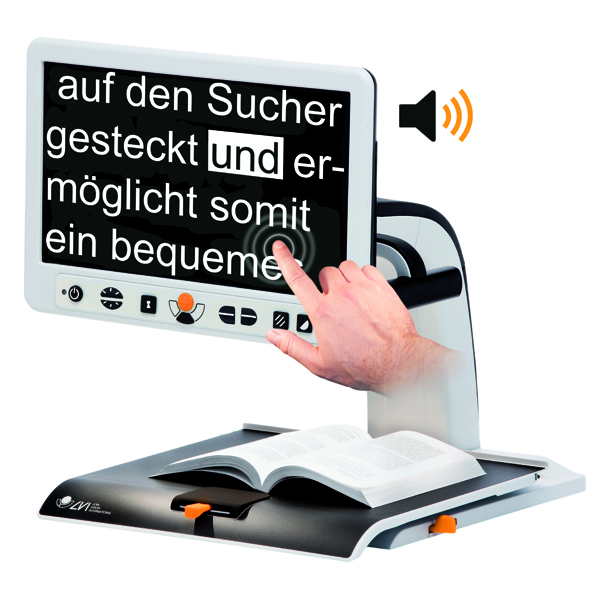 This is the perfect combination for increasing reading speed and is also a forward-looking solution for persons with a degenerative vision loss.